I recently wrote a letter to the Pochin Family regarding one of the legends of the Humber Stone. William Pochin was the man who dug out the Humber Stone in the 1860s and ever since then, a legend has circulated. The legend is of the curse of the Humber Stone and it says that because Mr. Pochin tampered with the stone he was cursed. It reported from numerous sources that soon after he excavated the stone Mr. Pochin had an accident and shot off half of his own hand. I am pleased to have received a letter from Mr. Pochin’s great-great-grandson who has finally cleared up this myth. Yes, he has heard about the myth of the Humberstone – that anybody who defiles it has bad luck – but this wasn’t the case for William Pochin. William had an accident with a firework at age 6, which damaged his hand and this was many, many years before he ever came into contact with Leicester’s grandest standing stone. The legend was hearsay and as time went by nobody has investigated it, but many have happily regurgitated it in numerous publications. I am happy to finally find the truth and to correct the memories of Mr. William Pochin, who we have to thank for the image below (he is not the man in the image, I might add). 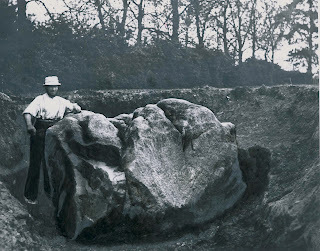 Many years ago she had been doing her own research into the Humber Stone and a lady contacted her to say that the man in the picture (above) was her grandfather and the lady invited her round her house to discuss the stone. She was told not to bring a pen and paper and not to bring any recording equipment. She was also told not to tell another living soul about the things she would learn. The lady who contacted me hid a tape recorder in a parcel when she went to visit and before she entered the house, she hit record. After her visit, when she left the house she checked the recording. It certainly recorded, but all that was on the tape was loud static. She tested it again outside with a new recording and it worked! “What did the lady tell you?” I asked. I was so frustrated. She told me that she was told so many amazing and wondrous things about the stone, but she dare not tell another person – not even her own family. What she could say was that the Humber Stone was an alter stone used by the druids. She said there were alter stones at Barkby on Ridgeway, in Markfield on Alterstone Lane and in Parker Drive, off Blackbird Road. Apparently the stone ran up the side of the speedway (I believe she was referring to the old St. John Stone). There was also something in Enderby, she said, an old mistletoe bush worshipped by the druids, and also an old quarry nearby where the Humber Stone came from. Yes, the stone was quarried she said – it wasn’t, what geologists call a glacial erratic. Interestingly, from my own research, there is evidence that there was quarrying in Mountsorrel (the origin of the Humber Stone) before the Romans arrived – so maybe it is possible that the stone was quarried. She went on to say that someone has calculated that the Humber Stone is also a marker stone and there is one every 3 miles, from the sun rising in the east, to setting in the west. Sadly, from some research, I don’t think this is true – maybe the stones have all gone though? She also mentioned anther legend of a giant who brought the stone on his horse from Mountsorrel. Could this be a version of the myth of the giant Bel of Leicester? This is the first time I have heard somebody link the Bel myth to the Humber Stone. Here’s the interesting thing. The lady that rang my correspondent said that there is a building in Leicester named after her grandfather (in the picture) and there is a stone in this building which is of significance with regard to the Humber Stone. She could not tell me anymore because she believed other powers were at work and she did not want to be another one of the Humber Stone’s victims. So there we have it – two very interesting correspondences about the Humber Stone. I don’t know what I believe about the second one, but it deserves a little more research, that's for sure!